Malaysians are expected to live longer but that also means we will need more money to support ourselves through our golden years. Some experts say having investments is no longer an option but a must. THE popular saying “health is wealth” is something everybody should keep in mind. But with Malaysians having longer life expectancy, there is now a need for more wealth to support our health. A newborn baby girl in Malaysia today is expected to live up to 77 years – over 10 years longer compared to 1970. Malaysian boys, though having shorter life expectancy, are also said to be able to enjoy a longer life span of up to 72 years, as opposed to 61 in 1970. Such vast improvements, recently revealed in the State of Households II (SOH II) report by the Khazanah Research Institute (KRI), are heartening to note. But the longer life spans also spell the need for more savings among Malaysians so that they will have enough to go around, especially after retirement. Unfortunately, this has become a steeper, uphill climb due to the spiralling cost of living and inflation. The SOH II report may have indicated that households are earning more in 2014 compared to 2012 but whether such wages are enough to sustain a longer life remains to be seen. 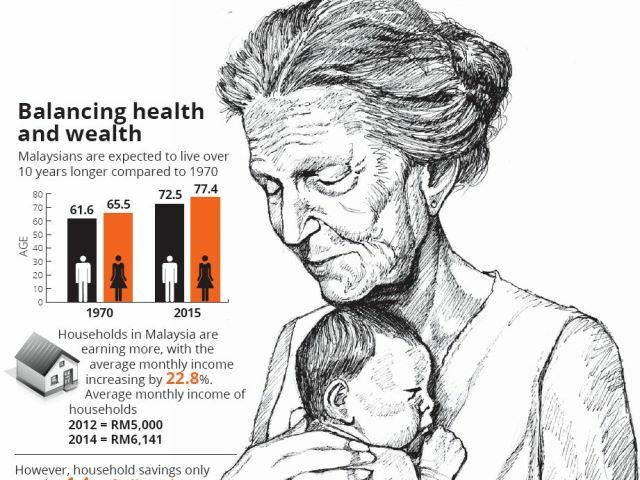 Last year, Sunday Star ran a series of stories highlighting the socio-economic challenges facing our ageing nation. In July 2015, we front-paged how poor retirement savings and low financial literacy faced by a soaring population of seniors are among the reasons why Malaysia is not prepared to become an ageing nation. A month later, Women, Family and Community Development Minister Datuk Seri Rohani Abdul Karim shared how one in five Malaysians, aged 60 and above, work – for most, because they have to. Then surprisingly, we found in September, the living standard of an elderly Malaysian household is lower than in most East Asian countries, yet Malaysians still dream of retiring early. While one can build up savings for retirement, some experts are saying that it is no longer enough and people must invest to make their money grow faster. One such expert is independent financial adviser Yap Ming Hui, who believes Malaysians should start learning how to invest. “With the current scenario in Malaysia, having investments is now a must, and not a choice,” he says. Many of Yap’s clients have savings, including fixed deposits, but with the bank paying an interest of only about 3%, the money does not grow faster than the inflation rate. “The weakening ringgit also causes the end result to amount to almost nothing and thus, the need to learn to invest,” Yap says, adding that Malaysians should aim to get at least 8% of annualised returns for the money they use to invest. For those who do not have much cash left after their necessary expenditure, Yap says they should start investing in small amounts like buying shares or investing in unit trust. “For those who are a bit more well-off, go for properties,” he advises. He explains that investments were considered an option about 30 years ago when the inflation rate was lower and wages were relatively higher. “But in the current environment where inflation is high and incomes are growing relatively slow, you must make your money work harder for you,” he says. Yap says some are afraid of investing because they do not have enough knowledge on the subject and are fearful that they may lose their capital. “The only way to cross this barrier is to educate yourself and consult a financial adviser, if possible,” he says. He adds that having good discipline is also important as those with high incomes may end up with very little left if they do not control their expenditure. “You must aim to save 30% of your gross income every month, inclusive of your EPF (Employees Provident Fund) deductions. That is the benchmark. “If you don’t have an EPF account, you should also aim to save 30% of your salary to get yourself on track,” Yap says. Another rule of thumb is to buy insurance to cover critical illnesses so that medical costs can be transferred to insurance companies when one gets old and ill.
One of the worrying facts in the SOH II report is that household savings only stood at 1.4% of adjusted disposable income (disposable income including social aid) in 2013. By comparison, the household savings rate in the United States, which is generally acknowledged as being very low, is much higher than Malaysia, at 5%. The report also revealed that those aged from 51 to 55 have an average of RM159,952 in their EPF accounts. But with the current interest and inflation rates, this average amount will only last an individual 15.6 years if they live on the current poverty line income of RM930 per month for urban Peninsular Malaysia. “This illustrates the concern that the population may not be well prepared to financially support themselves as they continue to live longer,” the report says. On whether Malaysians should take up side businesses to increase their income, Yap says it is fine for those who can afford to do so but generally discourages such a move. “Side businesses or part-time jobs may distract a person from their main job. It also encourages one to be a Jack of all trades but master of none. “This means that people will not be good in what they are doing and will only become an average employee in their chosen field,” he says. Instead, Yap encourages Malaysians to pursue careers that they are passionate about and deepen their knowledge in it so that they can become highly skilled. “Doing so will enable them to not only increase their income capability but also add value to their respective industries,” he says. Financial coach and Aged Care Group chief executive officer Carol Yip says Malaysians are expected to face greater difficulties as they age as a result of living longer and the rising cost of living. “The need for medical assistance, long-term care and services to assist us with daily living becomes very real. “If the proper infrastructure for an aged care ecosystem isn’t set in place to help us pay for these things, we will find ourselves stuck between a rock and a hard place,” she says, adding that 10% of the population is projected to be aged 60 and above in 2020 and 15% in 2030. “Now is the time for financial institutions to come together and work on an integrated financial system, whereby Malaysians with investments, including properties, EPF savings and pension income, can consolidate to pay for their healthcare and aged care needs,” she says. Yip says such a move will help Malaysians to pool their funds and tie in the ecosystem of care services. “As we live longer, the possibility of requiring some form of care is inevitable. Hence, planning for this is crucial to prepare us for the future,” she adds. Urging the Government to support aged care initiatives, Yip says the country needs regulations and guidelines to incentivise businesses in providing quality products and services for the ageing population. “The Government also needs to make care services and products affordable to all Malaysians,” she says. Looking ahead into the future, KRI managing director Datuk Charon Mokhzani foresees that it will be a trend for older people to return to work in view of the increased life expectancy. He says some retirees may also take up jobs unrelated to their profession. “There is nothing wrong with working when you are in your 60s or 70s. As long as people are able to do it, why not? “Even if you have enough money, you can’t just sit or play golf all day, everyday,” he quips. Charon says it is not feasible for one to support themselves throughout 20 years of retirement with savings from 35 years of working and many older folks will have to either continue working or seek employment. “We hope employers will also be more open towards keeping older employees. But on the flip side, they would also have to balance it with providing opportunities for fresh graduates,” he says. Pointing out that the falling birth rate also contributes to an ageing population, Charon says many countries are also facing a similar situation. “The Government can encourage the people to have more babies but at the end of the day, it is a personal choice. “Another way is to allow the entry of immigrants to keep the population young,” he says. Noting that the Government is addressing the ageing population growth, Health Ministry deputy director-general Datuk Dr Jeyaindran Sinnadurai says there is also a need to ensure people age well. “While we are becoming an ageing population, we are not necessarily ageing healthily,” he says. He points out that about 40% of Malaysians above the age of 35 have high cholesterol while 35% of them have hypertension. Some 17% of this age group were also found to have diabetes. “That is why the ageing population phenomenon is not only about addressing the welfare of senior citizens, but also urging the young to start caring for their health now to enjoy a better quality of life as they age,” Dr Jeyaindran says. Dr Jeyaindran adds that it will also be less costly for those who age healthily. “The obesity rate in Malaysia is one of the highest in Asia as well. So apart from wealth management, there is an equal need to manage one’s health,” he says.